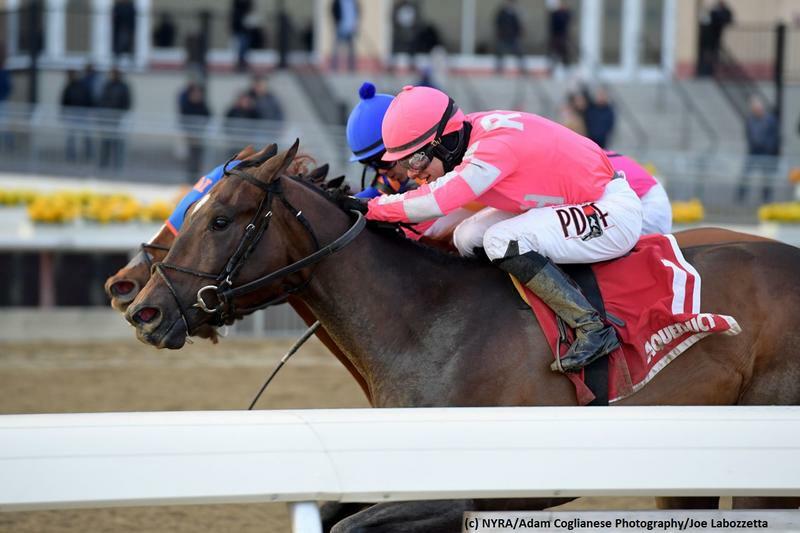 R. A. Hill Stable, Reeves Thoroughbred Racing, Hugh Lynch and Corms Racing Stable’s TAX took a short lead nearing midstretch and gamely held off a pair of stern foes to take the $250,000 Withers Stakes (G3) at Aqueduct on Saturday. The gelded son of Arch finished a head in front when completing 1 1/18 miles on the fast main surface in 1:50.23 under Junior Alvarado. His win earned him 10 points on the Road to the Kentucky Derby. Not That Brady, the 8-1 fifth choice in the field, sped to the lead from his outside post and carved out splits of :23.56, :47.39 and 1:11.44 for the opening six panels while holding a one-length advantage over Our Braintrust, with Tax in close arrears along the fence. Turning for home, Tax was asked for his run and the 2-1 favorite took a half-length lead in the lane, but the race was far from over. Not That Brady and Our Braintrust fought gamely to the finish, with the former finishing a neck clear for the runner-up spot. Alvarado was impressed with his charge and hinted that better things will come down the road from Tax. Trained by Danny Gargan, Tax was worth $6.20, $3.90 and $2.80, while topping the $41.60 exacta and $120.48 trifecta. The Kentucky-bred upped his lifetime line to 4-2-1-1 with $186,300 in earnings, in the process. Tax debuted at Churchill Downs in September in a $30,000 maiden claiming event and finished second. Returning in three weeks, the gelding made good against $50,000 claimers at Keeneland. The son of Arch then tried graded foes in his initial run with winners and finished a strong third at 17-1 in the Remsen Stakes (G2), beaten by just 2 3/4 lengths while always in contention. Tax was bred in the Bluegrass State by Claiborne Farm and Adele B. Dilschneider. The sophomore was produced from the winning Giant’s Causeway mare Toll, who is a half-sister to stakes heroine Cheery, the dam of dual Grade 1 queen Elate. Toll has since thrown an unnamed yearling colt by Orb. According to his conditioner, Tax could next appear in either the Tampa Bay Derby (G2) or Turfway Park’s Jeff Ruby Stakes (G3), both on March 9. Returning to Empire State for the Wood Memorial (G2) on April 6 is another one of the targeted races for the up-and-coming three-year-old.